Between October 15 and November 15, students, faculty and staff donated 729 pairs of socks and 740 non-perishable items for a total of 1,469 items donated for SOLES-Giving. The Department of Leadership Studies won with our donations totaling about 50 percent of the overall donations! Thank you to all who participated! 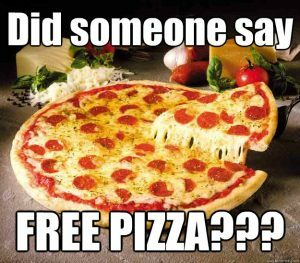 The winning prize was a pizza party, which will be held on January 29, 2019 from 4:30pm-5:30pm in MRH 200 (the upstairs living room in SOLES). Come join Leadership Studies faculty, staff, and students to kick off the new semester with some pizza!